Happy Friday! :) Oh my goodness...only one more sleep 'til our grand opening celebration. I am beyond excited! I have more images to introduce to you today, so I'll hop right to it. The first card features the "Cherry Sweet" cling mounted rubber stamp set. Is she cute or what? This card will be entered in Mercy's Tuesday Sketch Challenge #93. Oh, isn't this little gal just the spookiest!?! LOL I used a digi image called Tabitha for my second sample today. 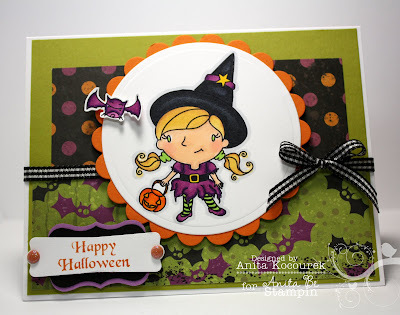 I just adore this little witch! This card is based on SCS Sketch #300. My last card features a digi image called Tallulah. Isn't this gal so prim and proper!?! I dressed her necklace up with some rhinestones and gave her a "diamond" earring to match. Love it! This card will be submitted to Pink Elephant Challenge # 84. 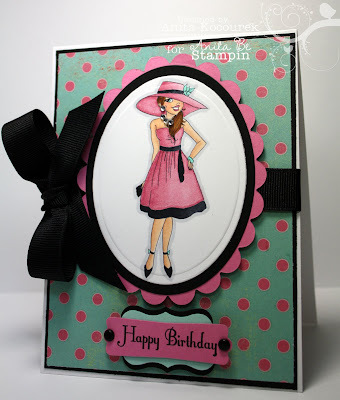 Don't forgot to pop say and hi throughout the day at the Anita Be Stampin PCP group tomorrow. We will be giving away goodies, and you won't want to miss your opportunity to win! Thanks so much for stopping by today!